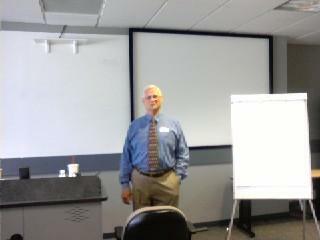 Berton Lee Lamb at U.S. Office of Personnel Management training center. Berton Lee Lamb was recently invited to lecture at the U.S. Office of Personnel Management’s Eastern Management Development Center in Shepardstown, WV. His presentation on the subject “Multi-party Environmental Negotiations” was well received by students from the USA and India. The Indian students represented Indian national and state governments, including the ministries of Corporate Affairs, Tribal Affairs, and Home Affairs, as well as Departments of Heavy Industry and Pharmaceuticals. Executives from the USA represented the Army Corps of Engineers, Environmental Protection Agency, Department of Commerce, and others. During his presentation, Lee described the unique features of environmental negotiation and talked about negotiation strategies, and common pitfalls in environmental negotiation. An outline of Lee’s presentation is available from Negotiation Guidance Associates. To request a copy of the lecture notes and resources, please enter a comment to this post. This entry was posted in Negotiation Training, Resources, Training Results and tagged Alternative Dispute Resolution, Bargaining, Conflict Resolution, Dispute Resolution, Multi-party Negotiation, Negotiation Coaching, Negotiation Training, negotiationguidanceassociates, Successful Negotiation. Bookmark the permalink.